A month or so back, I got to spend an hour with the Oculus Rift VR headset—most of which I spent swooning over Portal 2. Ever since that time I've been dying to get the Rift wrapped around my head for a larger chunk of time. And when that dream turns to reality, the question becomes—what game do I play? According to RiftEnabled.com, a database of games and apps being developed to work with the Oculus Rift, there are currently 216 projects that have been announced (and there are likely many more that have never been added to the website). Of these, more than half have been released. Many of these projects are small tech demos or proof-of-concept games specifically designed for the Rift. However, as you can see from the following list, there are more than a few big name titles that work (or will soon work) with the device as well. Of the above games, however, few (those with asterisks next to their names) have been actually reworked by the game's original developers for Rift support. The majority of them support the 3D headset through the use of independently created drivers. Currently, there are two of these drivers getting most of the press. The first is Vireio. It is free and regularly updated with new games. The second is VorpX. And while it supports more of the games listed above than Vireio, it is not available for free download. 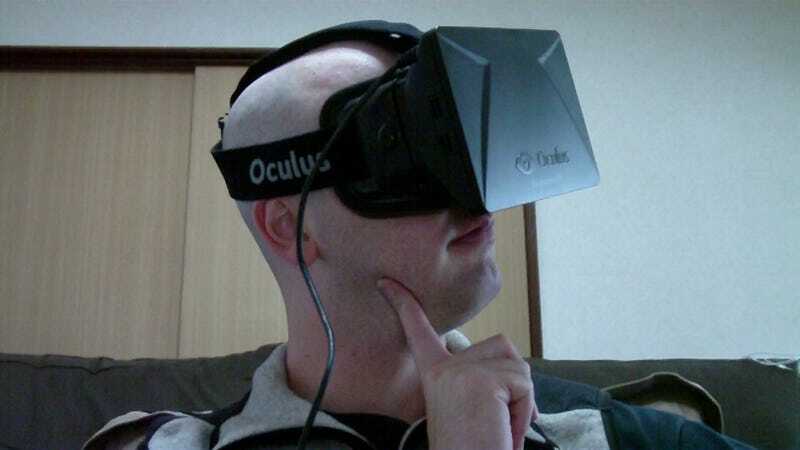 Rather, upon the release of the consumer model of Oculus Rift, VorpX will be released as a commercial product. But as for my original quandary—what game to play when I next get some quality time with Oculus Rift—the answer is really a no-brainer: Dishonored, which I picked up at the Steam sale last week. I'm going to play that sucker for like 15 hours straight.